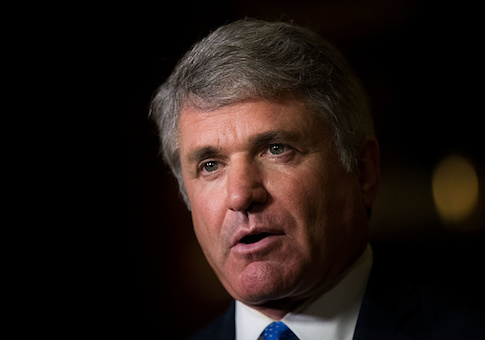 House Homeland Security Committee chairman Michael McCaul (R., Texas) on Monday called for the publication of the classified documents that served as the basis of a Republican memo accusing federal law enforcement officials of abusing surveillance tools to spy on a former Trump aide. Republicans allege the four-page memo released Friday shows the Justice Department and FBI failed to disclose critical information to federal judges when applying for a Foreign Intelligence Surveillance warrant to wiretap onetime Trump campaign adviser, Carter Page. Democrats, who are pressing for the release of their own counter memo, say the Republican document cherry-picked facts from underlying classified documents in an attempt to protect President Donald Trump and discredit the special counsel's investigation of Russian meddling in the 2016 presidential election. In remarks at George Washington University, McCaul called for public access to the classified law-enforcement material the memo was based on. "I believe that the entire FISA application, including the affidavit attached—taking out methods and sources—should be released to the American people so we have a full context of what was the basis for the application from an evidence standpoint," McCaul said. Government officials seeking to monitor a target under the FISA law must submit an application to a surveillance court presenting probable cause that the individual in question is acting as an agent of a foreign power. Republicans say the application to monitor Page relied excessively on unverified information gathered by former British spy, Christopher Steele, whose controversial dossier was partly financed by the Democratic National Committee and directed by the opposition research firm Fusion GPS. "These applications need to be based on evidence," McCaul said. "My concern after reading the document, and granted it was coming from the Republican side, was that one of the principal pieces of evidence was a dossier memo that then-FBI director [Jim] Comey came out later to say was salacious and unverifiable." The Texas Republican urged the Justice Department's inspector general to broaden its investigation of political bias at the FBI to include the bureau's request to monitor Page and determine whether it was valid. The House Intelligence Committee is set to vote Monday evening on the release of a Democratic memo that refutes the document published by committee chairman Devin Nunes (R., Calif.). Republicans on the committee voted against the publication of the Democratic memo last week, but several GOP members have said they now support its release. If approved, the measure will go to the White House for final authorization. Following McCaul's comments Monday, Rep. Will Hurd (R., Texas) said at George Washington University the minority report should "absolutely" be released. He rejected claims by Republican colleagues who say their memo exonerates Trump from the Russian investigation. "The memo is not a rebuke of Bob Mueller's investigation," Hurd said. "Bob Mueller should be allowed to turn over every rock, pursue every lead to completion and we have to have trust in that process." Republican Reps. John Katko of New York and Mike Gallagher of Wisconsin said they agreed with Hurd's remarks. This entry was posted in National Security and tagged MIchael McCaul. Bookmark the permalink.